WASHINGTON D.C. – Today, Campaign for Accountability (CfA) launched the Google Transparency Project (GTP), an online resource that allows the public to explore the company’s influence on government, public policies, and our lives. Click here to visit the Google Transparency Project. 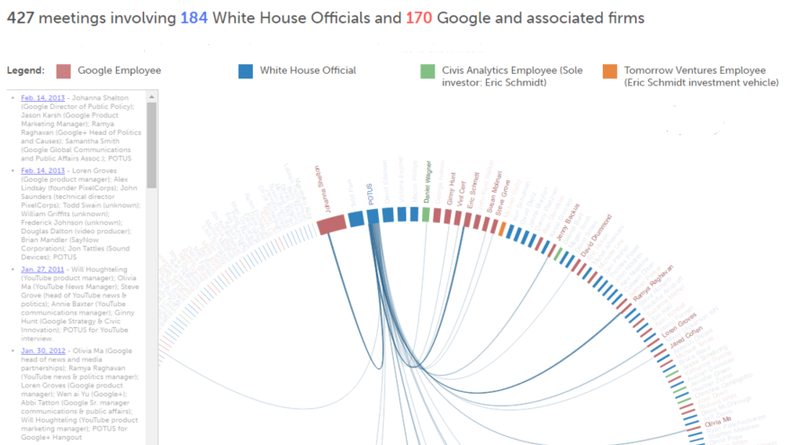 The first uses White House visitor logs to catalog meetings between employees of Google and related companies and White House officials, revealing unrivaled access: 427 meetings between the time Obama took office and October 2015 — or more than once a week (Once every 5.8 days, or once every 4.1 working days). Click to the image to view all of Google’s White House meetings. The second project lists “revolving door” moves in the US, when Google hired a government official or a Google employee went into government. The dataset highlights the astonishing level of traffic between the two in both directions: 251 people either moved from Google into government or vice-versa, since Obama took office. Click the image to see more about Google’s revolving door hires. The GTP can be accessed at: http://googletransparencyproject.org.